College without that ONE dormer friend is just...kulang. 1. Working with limited space. In a dorm where you share a room with one to who-knows-how-many-other-people, you've probably mastered the art of working in a super tiny area. Every person in the room has her own corner, and the number one unwritten rule? Never mess with someone else’s space. 2. Never having to worry about traffic. You never get the “Saan ka na? Sabay tayo pasok sa room” text from your friends because duh, your 7 a.m. class is literally 10 steps away from home. 3. Living under a strict budget. Your weekly or monthly budget never seems enough with all the project materials, coffee study sessions and barkada gimmicks that you HAVE to spend for (they're serious needs, okay!). Not to mention the daily meals that you need to basically survive life. 4. Engaging in fast food chain marathons. Jollibee, McDonalds, KFC, Shakey’s, Pizza Hut. These are your lifesavers when hell week arrives, where you have no time to make Good Healthy Food Choices. 5. Being involved in takas attempts. Everybody knows how strict the lady guard in the lobby is about curfew, and you and your roommates have tried sneaking out of the dorm for a college party afterhours. Sometimes you succeed, most of the time you DON'T. Lol. 6. Labeling your food. It’s not that you accuse your roommates of eating your stuff in the fridge, but it's just better to label things for your sanity. 8. Mastering the art of microwaving. Most dorms don't allow you to cook food inside your room for safety reasons (and even if it did, you ain't gonna cook! ), so you've learned to microwave everything. 9. Overcoming homesickness. Every dormer has definitely experienced this. There's a lot of crying from wanting to see your dog, looking for mom's weekend lunches, and missing the smell of dad's morning coffee. #DormLyf is the best, but you miss home. 10. Feeling independent. Congratulations, adult! 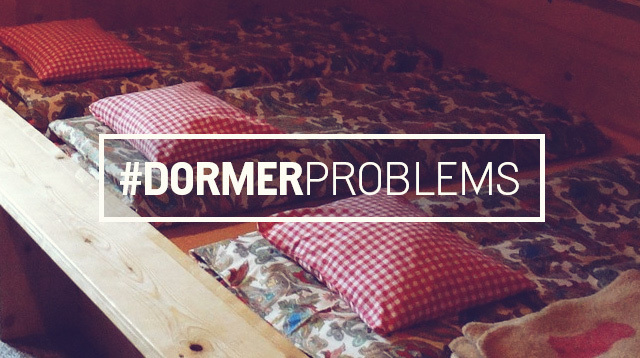 Being a dormer means you can live on your own without yaya's help!